While January might not be harvest season, there is still a bounty of fresh seasonal produce to be enjoyed. Winter might not come with tender greens and ripe juicy berries, but sweet squash, crisp pears, and deep hearty cooking greens are bountiful and incredibly delicious. Squash is one of the season’s jewels. It is hearty, creamy, filling, and so versatile. 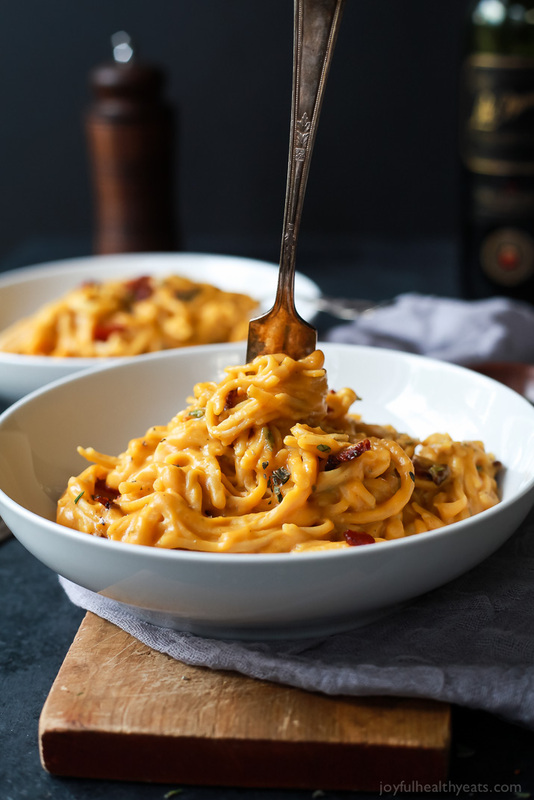 It can be used to create this drool worthy Creamy Butternut Squash Alfredo Pasta (pictured) or it can be added to theses 5 Ingredient Butternut Squash Fritters for some great flavor. Good news. Squash can also dessert. The proof is in the pudding, or in this case, these Buttercup Squash Crumble Bars. Oranges are a winter staple. When the weather gets cold, oranges get sweet and their acidic bite can add complexity to any dish. They can be made into healthy Orange Gummy Bears for the kids (or adults! ), baked into gift-worthy Cranberry Orange Bread, or juiced into this lightened up Orange Chicken Stir Fry. It might as well be the year of kale. We are seeing this nutrient packed vegetable everywhere, especially in the form of salad. If you are on a kale salad overload, you are not alone and you’ll be happy to know that this green is surprisingly versatile. It can be whipped into Roasted Garlic Kale Hummus, be used to make Kale Pizza Crust, and is perfect in this Spicy Simmered Eggs with Kale recipe. Did you know that there are over 3,000 types of pears! We only regularly see up to ten of those many types in the grocery store, but with those ten varieties, you can make hundreds of delicious dishes. Try making homemade Pear Crisps for the perfect lunchbox snack. On the weekend, this Pear Dutch Baby will be a brunch show stopper and just so happens to be gluten-free. Or, try this Pear Prosciutto Gorgonzola Pizza for a sweet and savory dinner.